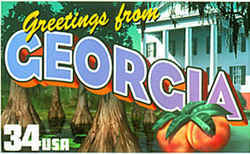 The General Assembly selected the peanut to be Georgia official state crop in 1995. Georgia produces nearly 50 percent of the total United States peanut crop and more than 50 percent of peanuts used in the production of peanut butter. Georgia leads the nation in peanut exports. Georgia produces nearly 50 percent of the total United States peanut crop and more than 50 percent of peanuts used in the production of peanut butter. Georgia leads the nation in peanut exports. In 2012 Georgia farmers harvested 730,000 acres of peanuts, the official state crop, for a yield of 3.3 billion pounds. The state's most famous peanut farmer, U.S. president Jimmy Carter, and his family raised the crop for decades in Sumter County. 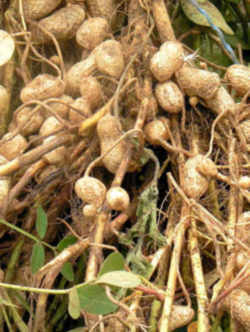 The peanut plant is a sparsely hairy, taprooted, annual bush about 45 cm tall when mature. 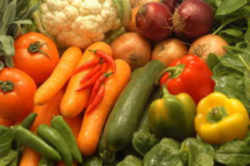 The four main botanical varieties are Virginia, Spanish, Valencia, and Peruvian Runner. They are distinguished from each other by branching habit, branch length, and hairiness. The most interesting facet of peanut growth is the development of the seeds. 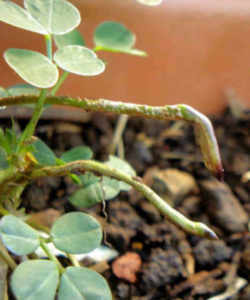 After the small, yellow flowers pollinate themselves, the stalks at the bases of the ovaries, called pegs, elongate rapidly and turn downward due to geotropism. The peg then buries itself several inches in the ground to mature in approximately four months . The peanut, (Arachis hypogaea L.,) is native to South America and is believed to have originated in the areas of Brazil, Peru, and Bolivia. In its native state it is a tropical, perennial plant. Brought to the South by explorers from South America via Africa, the peanut is thought to have been grown in Georgia about a decade before the Civil War (1861-65). Despite its name, the peanut is not a true nut but a member of the legume family. 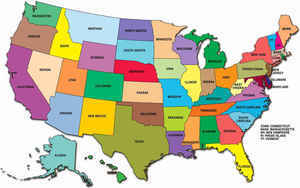 The term peanut is used primarily in the United States and Australia. Elsewhere around the world, it is usually referred to as a groundnut. 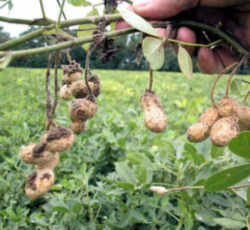 The sandy soils and subtropical climate of Georgia are ideal for producing large yields of high-quality peanuts. Peanut production in Georgia is concentrated in the Coastal Plain, the area south of the fall line, which runs from Columbus through Macon to Augusta. 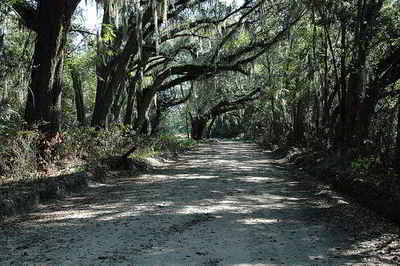 Only a few counties in the southern half of the state, those in the southeastern corner near the Atlantic coast and the Okefenokee Swamp, do not grow peanuts. Georgia peanuts require a long growing season of at least 150 days of warm weather. They also require about twenty-two inches of water during the growing season. To amend Chapter 3 of Title 50 of the Official Code of Georgia Annotated, relating to state symbols, so as to provide that the official state peanut monument shall be a certain peanut sculpture in Turner County; to repeal conflicting laws; and for other purposes. This monument to the peanut, Turner County's most important agricultural product, is dedicated to the memory of Nora Lawrence Smith, December 25, 1886 - July 17, 1971. Member, Georgia Journalism's Hall of Fame, Editor and Co-Publisher of the Wiregrass Farmer, Turner County's Award Winning Newspaper and an untiring supporter of Turner County and its agricultural economy. Architect: A. R. Smith, Jr.
Inc., Estate of Nora Lawrence Smith. WHEREAS, in 1993, the Georgia House of Representatives and the Senate each passed a resolution declaring the Turner County peanut monument as the official state peanut monument, and it is only fitting that the declaration of those bodies be memorialized in legislation. (a) The peanut is designated as the official Georgia state crop. (b) The peanut monument located in Turner County on the west side of Interstate Highway 75 within the limits of the City of Ashburn is designated the official state peanut monument." The law designating the peanut as the official Georgia state crop is found in the Georgia Code, Title 50, Chapter 3, Section 50-3-72. (b) The peanut monument located in Turner County on the west side of Interstate Highway 75 within the limits of the City of Ashburn is designated the official state peanut monument.